For many Americans, the early months of the year can be a struggle. Nasty weather compounds the effect of the lack of sunlight while the days are short. This time of year also seems to be a void of holidays! After so many events leading up to the New Year (both by the sun and the lunar calendars), the end of winter can be a struggle. It’s a good thing that new holidays are being celebrated every day! Annual celebrations and remembrances are planned in honor of things like pets, siblings, donuts, and trees. National Chili Day (February 28th) sounds like a nice idea this time of year, as does Napping Day (March 11th). 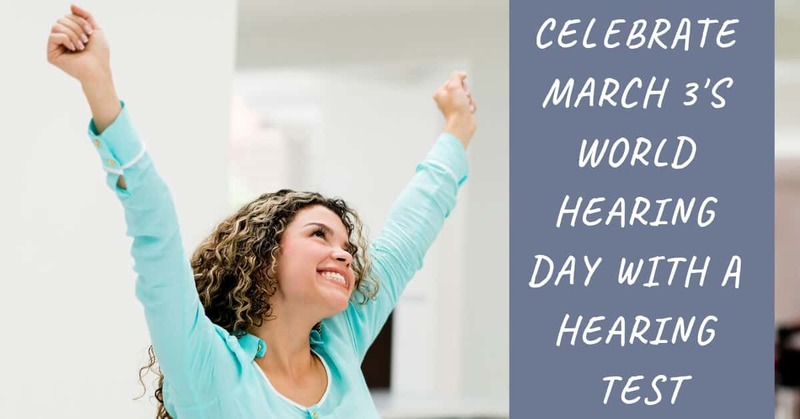 In addition to all of these quirky holidays that can break up the late-winter monotony, the World Health Organization (WHO) has introduced some clever “holidays,” as well. In an effort to encourage healthy habits and practices, this organization has designated days devoted to awareness around overlooked conditions. One of these events coming up on March 3rd is World Hearing Day! When you think of healthy practices, hearing may not be the first thing that comes to mind. Eating right, exercising, getting enough rest, and drinking enough water are classic habits that can improve your overall health. In addition to these basics, there are many other things you can do to improve your health in specific ways. With 466 million people around the world living with disabling hearing loss, it is crucial to put hearing on the list of important health outcomes. More than a billion young people between the ages of 17 and 35 are at risk of early hearing damage due to recreational exposure to loud sounds, including live music and the use of earbuds and loud headphones. These health risks add up to an enormous cost, as well. $750 billion is the WHO estimate of the global cost of unaddressed hearing loss. With these enormous statistics, hearing definitely deserves its own day for raising awareness. One of the things you can do to celebrate World Hearing Day is to engage in some preventative measures. Simple things like limiting your exposure to very loud sounds can have an enormous effect on your hearing health and overall wellbeing. We carry enormous stress in our bodies due to noise pollution, particularly in busy urban centers. Why not get some quiet time to celebrate the holiday, allowing yourself to feel the benefits of silence. The entire body tends to relax when it is not being assaulted with stressful noise, and your muscles may relax in response to the calming quiet. Another healthy hearing practice is to limit your use of loud music or sound through headphones and earbuds. Although this technology is beneficial in so many ways—even making it possible to talk to a loved one far away while walking down a busy city street—these loud volumes can have catastrophic effects on our hearing. Turn down the volume when possible, and be sure to take regular breaks. You might not even notice how loudly you are playing music, a podcast, or the audio for a movie or television show through your earbuds. Perhaps the best thing you can do to celebrate World Hearing Day is to get your annual hearing test. Even those who don’t think they have hearing loss can benefit from a hearing test. Setting the baseline hearing level helps your audiologist notice when hearing does start to decline. As well, you may have hearing loss you don’t even notice. Making an appointment for a hearing test is simple, inexpensive, and quick. Simply call us at Coweta Hearing Clinic to make an appointment for a consultation and exam. Once you’re here, you will find that the test is completely painless and easy to complete. With that information in hand, you will know if you need assistance or if there are other measures you can take to improve your hearing. Even if you don’t need to take action right now, knowledge is power. Celebrating this annual holiday with a hearing test sounds like a great way to take care of yourself in the rest of the year. Contact us at Coweta Hearing Clinic today!